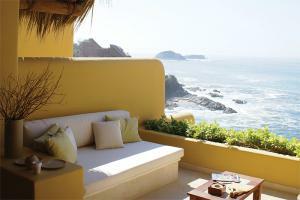 Capella Ixtapa Resort and Spa is set within a rock cliff, overlooking the azure blue waters of the Pacific Ocean. A unique look of handmade clay and stone meets sleek marble and polished hardwoods. Capella Ixtapa features only 59 rooms and suites, each facing the ocean as the hotel cascades down towards the Pacific. Terraces open up to the beauty of the Pacific. From this vantage point, you're in your own private world, far removed from beaches more traveled. Ixtapa's private beachfront is yours to explore.